Easy transaction. Was connected and working just as promised. A lot cheaper than a PoE switch! 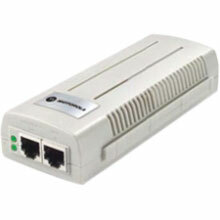 I have a Motorolla 6532 wireless Access Point in my home office, but don;t have a Power over Ethernet (PoE) capable switch. I couldn't find a PoE injecter that had the required power for my AP locally, but this dedidcate PoE injector has ample power. Easy to mount on a wall with screws to get it out of the way. I wish it were a bit smaller but it s tan color makes it blend in with the wall. The Motorola AP-PSBIAS-2P2-AFR is also known as MOT-APPSBIAS2P2AFR	or APPSBIAS2P2AFR	.